We accommodate Giant Free-Form Swimming Pool with size 100 sqm, Baby Pool with size 36 sqm and Rainshower Pool with size 25 sqm. 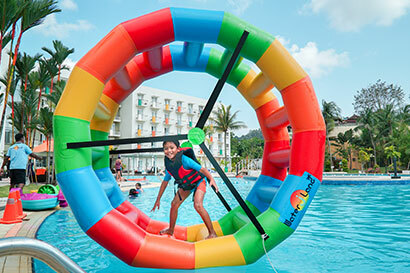 Enjoy our activities such as Roller Ball, Floating Mattress, Water Polo etc. Dino Kid’s Club is the perfect destination for your kids while staying in our resort. Through games, activities and challenges led by a dedicated team, children are inspired to unleash their imagination and do some excitement physical activity. Drawing on Asian traditions and modern touch, our massages are based on evolving techniques that passed through the hands of many generations. Sit back and relax under the intuitive touch of our therapists, reawakening simple sensory pleasures to define H'Spa. 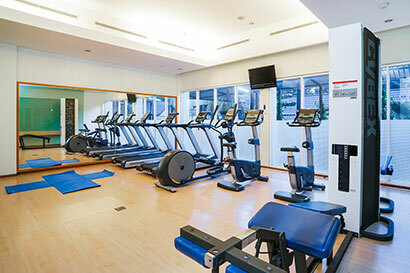 Keep up with your fitness routine whilst you’re away with our free hotel Fitness Center. Packed with cardio and resistance equipment and free weights, you can unwind after a busy day.